I was thrilled when The Collapsing Empire was announced as the winner of the Locus Award for Best Science Fiction Novel, but was not present for the ceremony because one of my best friends on the planet was getting married, and, well, priorities. Fortunately the good people at Locus were kind enough to ship it to me. I arrived yesterday, and what a pretty award it is, too. The art on the award comes from Hugo and Oscar-winner Shaun Tan, so that’s another reason to geek out about it too. And Smudge seems to like it, as you can see here. And clearly that is the most coveted endorsement. Thank you to everyone who voted for the book — I’m delighted to have this award at home. 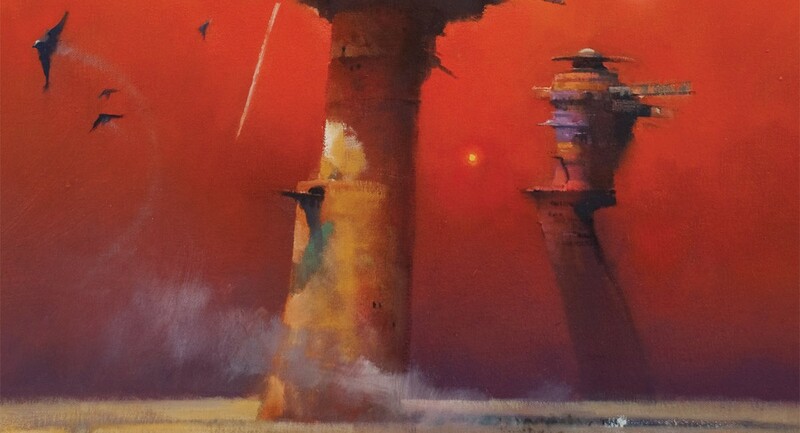 On the subject of awards, we are down to the final days to vote for the Hugo Awards, for which The Collapsing Empire is a finalist for Best Novel, along with some other very excellent works from NK Jemisin, Kim Stanley Robinson, Mur Lafferty, Yoon Ha Lee and Ann Leckie (not to mentionall the other excellent people and works in other categories). The final day to vote is this Tuesday, July 31st, and if you are a member of Worldcon 76, this year’s Worldcon, I definitely encourage you to cast your ballot for the work you admire. The link to the online ballot is here. So glad to see that Smudge approves! He is one handsome fellow, and his handsome self is very nicely set off with that handsome award. I cast my Hugo ballot a couple of weeks ago, but thanks for the reminder to go back and make sure I haven’t changed my minds about the ranking I assigned. It was a devilishly hard ballot this year – lots of really strong nominees, which is both wonderful and agonizing for voters. Good luck to all nominees! Nice award…too bad there’s a Smudge on it! Congratulations!! Congratulations John- and Smudge looks like he has recovered from his urine shower. If I didn’t know Smudge had recently acquired you, I might think that “John Scalzi” is Smudge’s pen name. Congratulations to you both! That moment when the cat finally grasps what its human does for a living. Also, thank you again for adopting Smudge. I’m not on Twitter, but I go to your Twitter feed anyway, just to see Smudge and the Scamperbeasts and Zeus. They bring so many smiles to my days, especially when I’m not working from home and can’t see my own furballs! 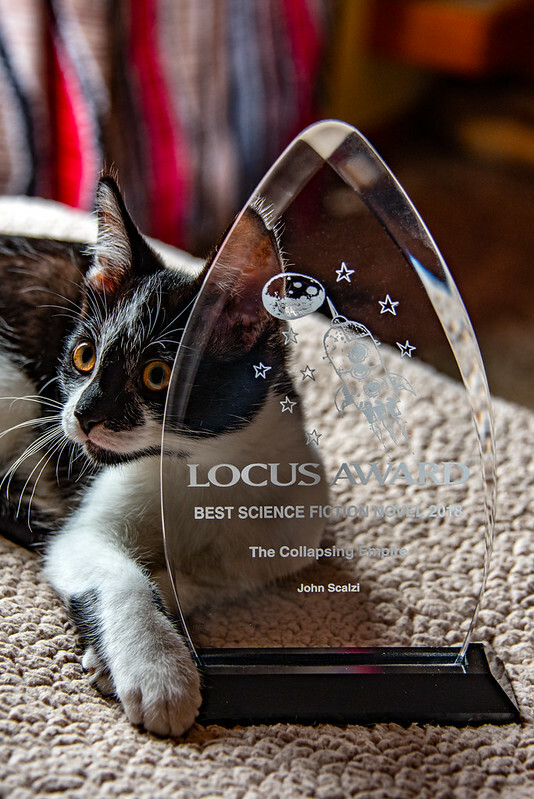 So, good going on the Locus, and also on the cats. I wish you much joy of each. Smudge doing a tip top Bradbury homage there.